New Machine- New Service- Quickprint's been Foiled! 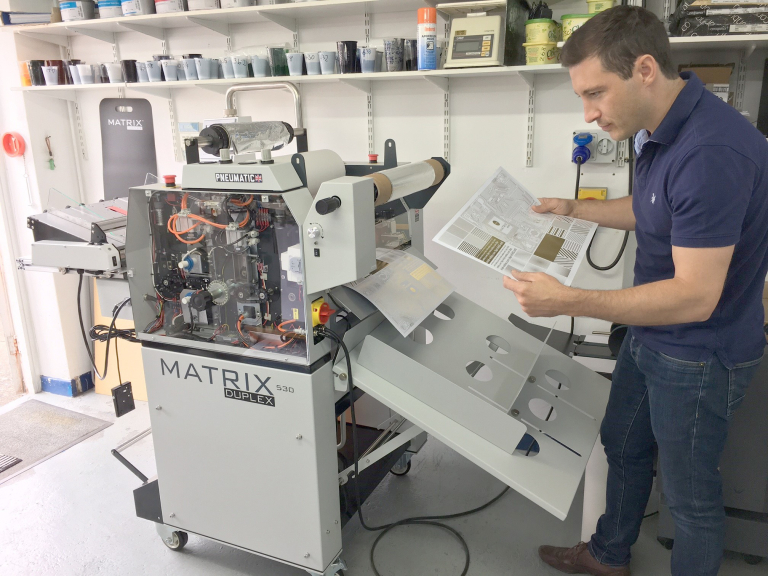 Our new Matrix 530 Duplex Laminating System allows us to create amazing foil and spot-UV effects on all types of digital print in a variety of foils (gold, silver, copper, red, green, blue and clear spot UV). White, silver or gold foil on business cards look great, foiled invitations for parties and weddings - holographic badge effects for security print on tickets, the possibilities are endless . . .
. . . A new Soft Touch laminate is now also available. A superb piece of kit coupled with the top notch quality print we consistently produce - what more could you want? Talk to our Design Team, they can really make it work for your next print project. Call 01392 272739. QuickPrint's expertise turns your thoughts into reality - come into our copy centre in Heavitree and inspect our samples - you'll be amazed!! !